Hello, friends! Can you believe it’s Wednesday already?! The holiday weekend really has me off-track this week! 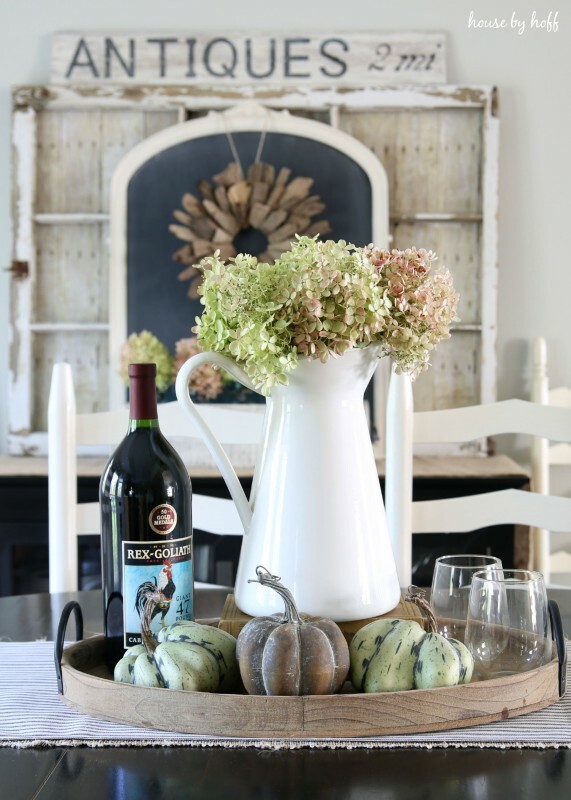 I recently finished decorating my dining room for fall, and I thought I’d share some pics with you today. Decorating this space usually comes pretty easily for me, but for some reason I struggled with it this time around. I tried a lot of different arrangements and accessories, but it wasn’t feeling quite “right.” It is pretty normal for me to struggle with at least one space when I redecorate for the seasons. Some of my decorating falls into place, but I struggle with other areas. When I struggle with decorating a space, and I’m feeling frustrated, I have some tried-and-true strategies to help me over the hump. Tip 1: Take everything out and start fresh. If things just aren’t coming together, I remove everything, from the space and start over. In this case, I took every accessory off of the table and the buffet and started over. I add things back in one by one. It was important to me to use this white pitcher, and my new wooden tray, so I started there. Next I added in the wine bottle and glasses, and finally added in the little pumpkins. Tip 2: Ask yourself if what you want to use really works in your space and with what you already have. So, truth be told, I really wanted sunflowers in this pitcher. The problem was that I also wanted this arrangement to coordinate with the arrangement on the buffet, and I didn’t have enough sunflowers to make that happen. I also thought it might be “yellow overkill” to have alllll those sunflowers in both arrangements. So, even though I wanted sunflowers, I had to admit that it wouldn’t really work with what I had, and wouldn’t allow me to achieve the cohesive look I was going for. When I gave up on the sunflowers, things really started coming together. Sometimes, we have to let go of something in order for things to fall into place. Tip 3: Consider what you have free access to. While I was in the midst of decorating my dining room, I was expressing my frustration with this space to my sweet coworker. She mentioned that she had a hydrangea bush, and that I was welcome to come snip some off if I wanted. She may be sorry that she offered, because I’m pretty sure I was over at her house that same night with my scissors. 😉 This is a great example of taking advantage of what you have access to though. Weather it means shopping your own basement, or snipping some flowers off of your (or a friend’s) plants and bushes, it’s usually worth taking into consideration what you can use for free! *For the record, I’m also an advocate for buying a few new pieces to work into your space too. 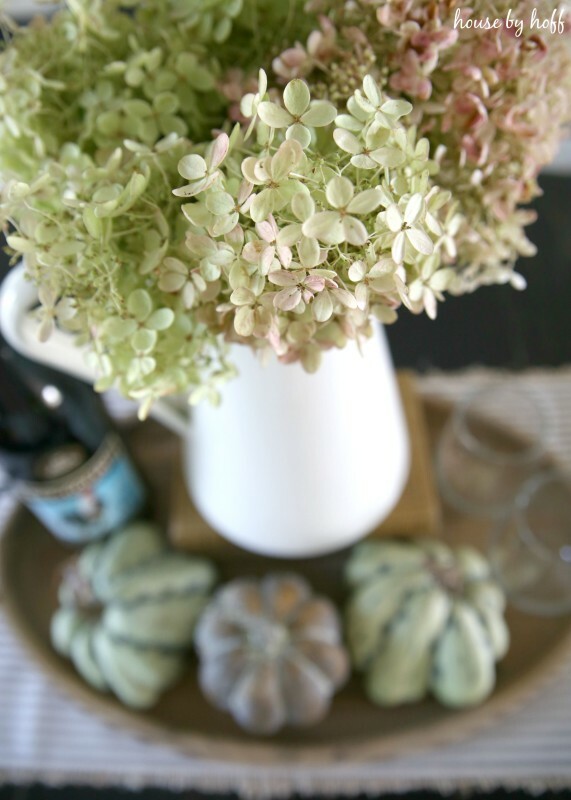 The tray on my dining room table is new, and I was excited to incorporate it into my fall decor. 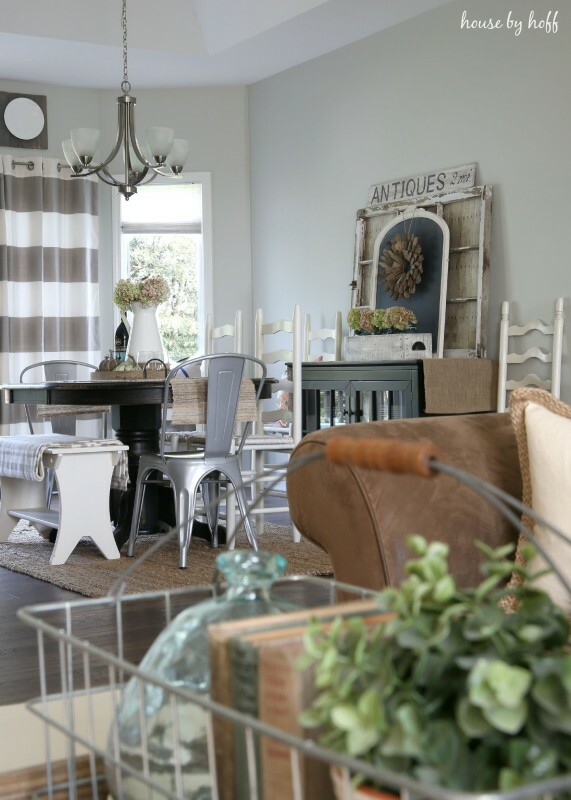 We all struggle with decorating certain areas of our house, whether it’s how to arrange the furniture, what kind of accessories to use, or how to decorate for a certain season. 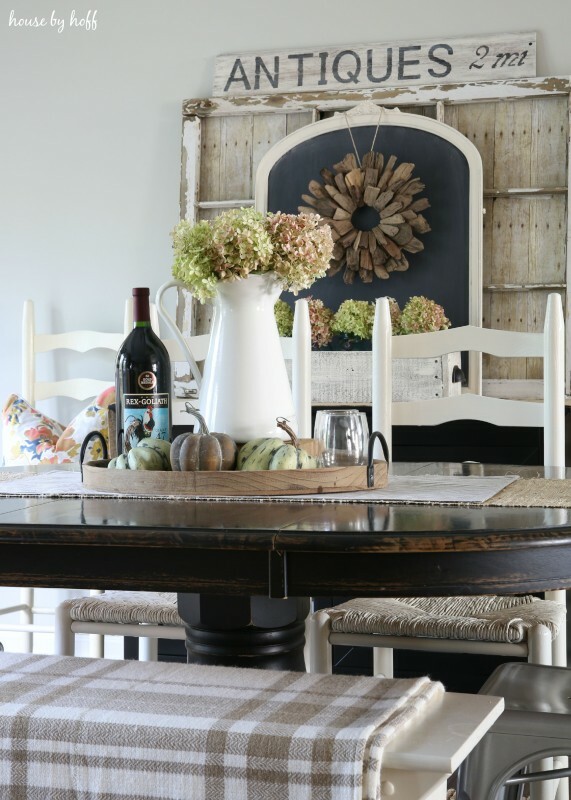 I hope you’ll find that these tips are applicable for many decorating dilemmas. It turned out beautiful! I love the soft, pretty feel. Thank you for the tips. I know exactly how you feel about feeling stuck, and wanting to use a particular decor item that just doesn’t seem to fit. I always enjoy your posts! It looks so pretty!! Love it! Lovely, once again. 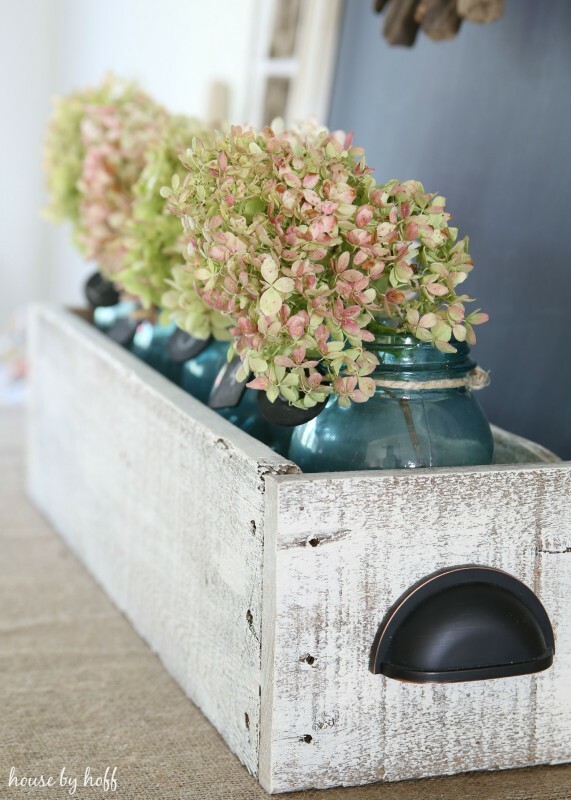 I love the hydrangeas, especially in the blue Mason jars. I know you are full-steam ahead into fall, but I’m stubbornly clinging to the last couple weeks of summer, so I think hydrangeas make a nice bridge. They are late-summer flowers with the muted colors of fall. April, all your decorating looks fabulous! Our hydrangeas are amazing this year! I am looking forward to drying a few more florets than I did last year. Thanks for the tips and I love that new tray. Have a great week. PS: How do you dry the hydrangeas? I tried it once and they ended up looking like, well, dead flowers! Where did you get your striped curtains? It is lovely! 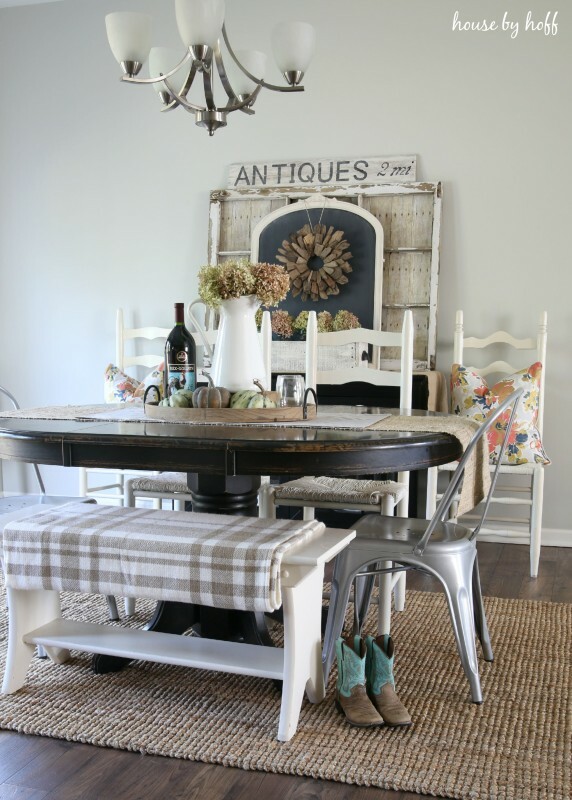 the table you have displayed is identical to our kitchen table with the finish as the exception. Did you finish it with something? And if the top was Formica what did you use on it? I would like to do this to ours but don’t know what to use to get those results. Thanks! I love all your decorating ideas! I do have a question- Where did you get your sideboard? I never thought of looking at a media cabinet for a sideboard . What a great idea. Thanks. This is the first time I have visited your sight. I will be returning often.